It has been a day of catch-up.......most of this week was a blur of time lost because of serum sickness. So I have spent the day catching up, speaking with friends, family members, reading.......Rick always says he knows when I'm too sick to read, it's time to worry. :) Thankfully, today I have read a great deal. August 31......I can't believe this is it, the last day of August 2014. Hot and humid in Alabama, but at least we got some rain yesterday. The leaves are falling from the trees, it has been so hot and dry the past few weeks, I fear our fall might be lackluster with no color. Tomorrow is Labor Day.......a day that I always think about my dad and his dad. My dad was a member of two Labor Unions, The Boilermakers and the Miners. Both, hard nasty jobs. He was blue collar all the way, with a heart of gold, and a spirit of love and joy. I am sorry that labor unions have gotten such a black eye in this country......without them, things would be so very different for workers. In my opinion, politics made a mess of the unions just like it has everything else. The beauty berries are starting to turn purple and even though the heat is raging, for me......when those berries turn that brilliant amethyst, fall has started its journey down south. The sumac has deepened and turned that rusty wine shade, and the even the oak leaves are starting to lose that deep verdant green of summer. Mother Nature is getting ready for change, so am I. 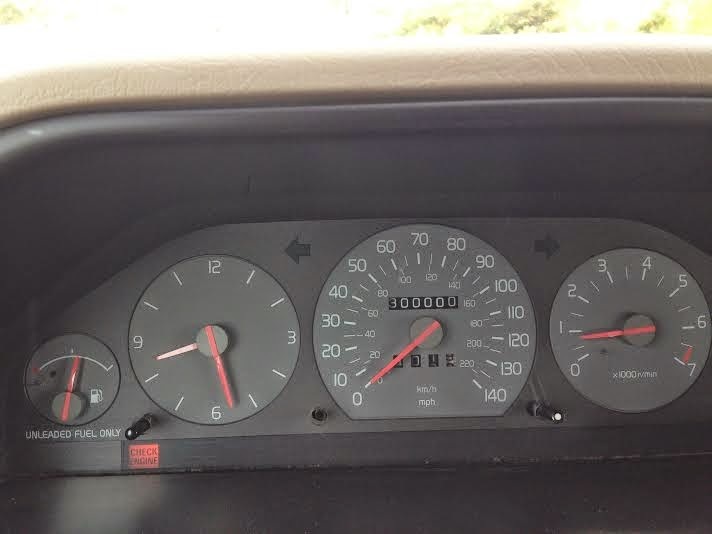 A milestone for my 1996 Volvo, Ingrid.........she rolled over 300,000 miles yesterday and is still going strong. Yes, I know the check engine light is on.......she does that to keep me on my toes. I know that sooner, more than later, I will have to get another vehicle.......that is a somber and sad thought. Ingrid is an old friend, she has seen me though the best and worst of times.....and honestly, she looks better to me than most any new car on the road. Way to go, Ingrid.....I knew we would make it........in my heart I'm hoping for another 100,000 miles, I think we can do it. Blame.......it's so easy, so very easy.......to blame others for everything.....for the way their lives are, the way their children's lives are, the way your life is. But, as adults........we make our choices.......we make our choices......and we live and die by them. It seems when there those who are going through hard times, that blame is spread like honey on toast. The other thing about blame, it comes down to power......power to make someone else feel bad, because you can't control them. The other nasty part of blame......judgement.....and that is when it really gets ugly. Nothing in the world like casting judgement on someone when they are down, when life is beating them up. When blame is tossed in your direction, you do have some choices........you can drown yourself in blame, be the scapegoat and the whipping post.......or you can stand up, keep the faith and follow your heart. Let the blame fall on those who cast it. A new friend ( we are IVIG treatment FB friends) reminded me tonight I can't forget the good times when I am not feeling so good. It was a gentle reminder that I needed to hear, and he is right. I admit, I have been down all week......and yes, today was another couch day. But, as my friend so sweetly said, " I know it gets better, because I have experienced the better part." Wise, true words. I am not always one to sing the praises of technology, usually I am the one bemoaning the advance of all things technical. But, to be fair, I am grateful for FB , because without it I would not have met this friend, and without him, not found out about a foundation for my illness, or a support group. Just the ability to communicate with someone who is going through so many of the issues that I am has helped. To know that a foundation exists, and I have talked with them today, gives me hope. Rare diseases are difficult for all. For those of us who have them, we are salmon swimming upstream, fighting to survive......for those who think the money should be spent on caring for the masses and the the few who are rare, let us sink or swim......well, I can promise you this, if it were you or someone you loved with one of those rare diseases, your thoughts would be very different. For all tonight, who are battling any illness, common, or rare........I remind you to have faith and remember the words of my friend, " I know it gets better, because I have experienced the better part." I hope we see the better part soon. Thanks for all your good thoughts, I do feel like myself tonight.......hopefully, I'm back for a while..
After the serum sickness hit yesterday, today has been couch day. I know I should rest, but these couch days make me feel as though time is flying even faster.......they feel like lost days. And days like today are truly couch days, too weak from the chills, nausea and dizziness and headache, to read or do much of anything. I know, my body is saying enough, get some rest. I am lucky, my co-workers and boss are so supportive........they keep saying take of you, we want you well........me too. Taz and Calliou make good nurses, well sorta, Taz lies at my feet, Calliou on the floor by the couch......they snore. The couch and I have had a long affair today. So, tomorrow is another day......my hope for myself, no more serum sickness......my hope for all of you, a great hump day! I am not sure how many more "this too shall pass" I have in me. On a more positive note, the oppressive heat has backed off. On the way to work today, there was a spotted fawn on the side of the road, she ran across the road after I passed. I never saw her mom, I hope she is ok. She was so tiny and beautiful. She was probably born this morning or last night. Sunday is my favorite day of the week......I was born on a Sunday......for me, Sundays are neither the beginning or the end......it is the day to just be. I love sunny Sundays and rainy ones.....I can always find something to do on Sunday. Though I don't attend a formal church service on Sunday, I do spend a great deal of time in meditation, I do spend time with nature........that is how I keep my Sundays sacred. This is the last week of August, most consider this the last week of summer......there are five Sundays this month. Lucky me. For many years we had a Nordic Track Ski machine.......I loved it. We used it daily for years, but the only place we had for it was in our guest room. We got tired of having to move it every time someone came for a visit.....so we gave it to our nephew. Well, a few years have gone by, Rick has put on a few pounds ( like most of us as we age) and his knees are not playing nice. Here in Alabama, when the heat and humidity build I can't do our daily walks because the air quality gets so bad. We both had spent a great deal of time discussing how to stay healthy, keep his knees happy and my lungs functioning........yep, we started to really miss our old Nordic Track. This week on Craig's list, Rick found one on for $75, a steal!!!! Unlike our old one, which was the most basic they made, this one was top of the line and looked brand new. It has a new home in our guest room......and if and when our friends visit.......I suppose they can hang their clothes on it. I spent five minutes on it today.......it was wonderful. I felt as though an old friend had come back in our lives. I know, you must be thinking how strange and weird.......but maintaining health has become a top priority for both of us. Teaching 8 yoga classes a week, keeps me in shape and peaceful.......but spending time on the ski machine makes me feel powerful and strong. I think it is a good match. Tonight, all I can say......we found our old friend.......I hope he stays a long time. We are living in the hot country this week......high temps, high humidity.....this too shall pass. It's obvious that summer is squeezing its last hurrah.......most of the garden is fading, the sunflowers are no longer bright and shinning, the zinnias are at their brightest. The light is changing......in the mornings now, there is a a touch of gold and the sunsets come earlier. The temperature will stay warm here for some time, but the days no longer feel like summer. Unlike most, I never mourn for summer's end.......I don't wish her to go quickly, but I love fall. I tolerate summer's heat and humidity........I feel alive in the fall. Tomorrow is Friday.......this weekend will be a laid back one......no gigs. The heat will make us move slowly, like molasses dripping down a short stack of pancakes.......and that's ok. I suspect there will be a pitcher of lemonade and one of sweet tea, the most active thing we will do is chase a few lightening bugs with Jordan. Rick looked at me today and mentioned that he knew I was feeling better.......how did he know? I actually had the energy to do a little house cleaning today. It is the first time since treatment that I truly felt good.........I am grateful. I spent the morning with a couple of friends. It was an impromptu gathering. I had dropped by my friend Brenda's to pick up a pair of pants she hemmed for me......our mutual friend Bec lives across the street, she saw my car and before we knew it, the three of us were sitting in Brenda's kitchen for over an hour laughing. Laughter and friends......the best medicine ever. On the way home, I passed by my older brother's house, they were home.......pulled in their drive way and spent an hour with he and his wife.......and yes, much more laughter. Maybe that is why I felt so good this afternoon, all that love and laughter. It has been a simple, good day......and it started at 6:30 this morning......Jordan called and asked if I would make him a blueberry smoothie for breakfast. He and his mom came over, and the day started with laughter and hugs. Sometimes you get what you need without asking.....that happened to me today. I hope it happens to all of you soon. I posted this quote on my board at work today.......it is one of my favorites and one that I try to always keep stored in my memory. I believe it is a truth. I love the smell of rain on dry earth........that smell surrounded me today, just after I got to work I heard thunder. A few minutes after I entered the building, the rain began to pour.......I opened the back door down the hall from my room and inhaled deeply. That smell, is like a reaffirmation that all is right with the earth, a good cleanse and she is once again a happy mother. It is the same way a bath makes me feel after a long hard day.......a couple of cups of epsom salts, a tub of hot water.......and all is right in my world. I am happy. Jordan has heard me talk about how great baths are, and his mom says the same thing......so now, if he feels bad or if he thinks any of us feel bad.....he says " take a bath, it will make you feel better." After all, we are mostly water.......that is why hydration is so important to all of us......water soothes us and reminds our inner self about that connection......we humans to water. If this has been a blue Monday, a difficult, stressful day.......play some soft music, light some candles, fill the tub........simple pleasures are the best.....and after all, you deserve the best. I hope it rains at your house tonight and you can smell the earth and feel her happiness. Life really is ups and downs.......the serum sickness has hit once again. Hopefully by tomorrow it will be gone. Wishing you all a peaceful Sunday night. We had a gig tonight with several of our songwriter buds. I MC'd the show and performed. Here I am backstage, taking a short break. It was such a fun time. I love my music buddies. Hope your Saturday night was as much fun as mine. Thank you all for your love and prayers last night. Though the treatment was reduced to one bottle, I still dealt with the serum sickness this time......but it was not nearly as bad as in the past. Feeling better tonight, interesting stuff this serum sickness........would not wish it on my worst enemy. Jordan spent the day with us. I had promised him all week that he could and we would make cupcakes. My sister Nell had given me a gadget for my birthday that takes a small round core from the cupcake and then you add filling. We made devil's food cupcakes, placed a marshmallow in the hole, and spread butter cream frosting on the top.......they were mighty tasty. Still rather weak and shaky, I think my bed is calling my name. Jilda's not feeling well tonight so she asked that I post in her stead. That's a tall order. Some of her posts reach deep, to places I cannot go. The treatment this time has not affected her as much as in months past. She thought she'd dodged a bullet, but that was not the case. Tonight, the only option open to her is to embrace the stillness. It has been a day to recharge and rest........a sky the clearest of blues, no humidity ........Jordan was here getting an aunt jilda fix.......school starts Monday, he is excited but he loves spending time at our house. Rick is still on jury duty, he comes home every evening looking exhausted. A funny thing today.......after Jordan's granddad picked him up, the phone rang......caller id said Walker County Courthouse, ( the county where we live). A woman from one of the judge's offices ask to speak with Rick, I tell her he is at the courthouse on jury duty. else. She keeps saying I don't want you to think he is not where he is supposed to be. I am sitting on the sofa thinking, I am not the one who has issues about where Rick is. Jordan and I had a really nice low key day.......his Florida vacation last week exhausted him. He told me Monday, that going to the beach every day was hard work. This day was perfect for me, just what I needed.....time with Jordan puts it all in perspective. Hump day.......not only is the week half gone.....but August is almost half gone. You know what I miss most about back to school? I always got new shoes......not always clothes, but always......new shoes. Rarely do I have a day like today........as I taught my classes this afternoon, it seemed that I was just spinning my wheels......attention spans seemed to be non-existent, students appeared to be there physically but on another planet mentally.......I am exhausted, my energy is spent. It was one of those days, when no matter what I did or said, nothing worked.....my words fell on deaf ears. I am so glad to be off tomorrow.......a break and time to recharge is greatly needed. Home, and hugs from Taz were all I could think about on my drive this evening. No place like home, no love like the love of a happy dog. Jordan spent the morning with me. 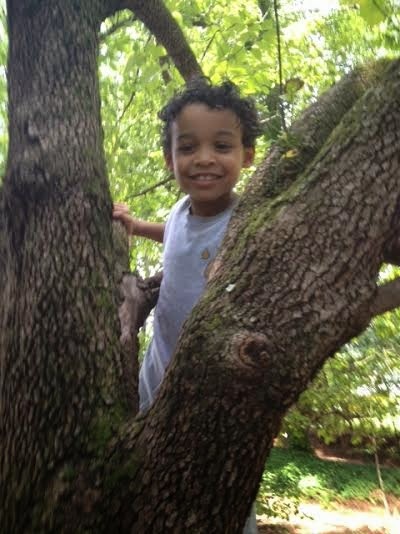 He climbed the magic tree......an old towering dogwood that his mom, Samantha climbed when she was his age. That magic tree has heard more giggles and laughter than you can imagine. Almost every niece and nephew we have has climbed it. It truly is a magic tree. My friend Becky loaned me a book by Richard Carlson, You Can Feel Good Again. ( common sense therapy for releasing depression and changing your life) I had read his book Don't Sweat the Small Stuff....and it's all Small Stuff in 1997. 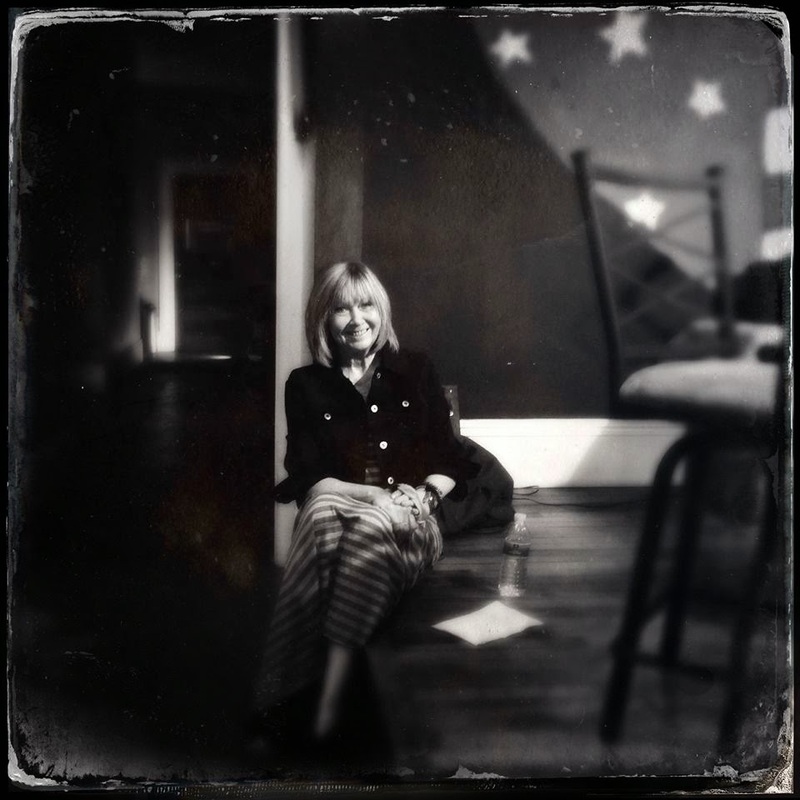 When Becky handed me You Can Feel Good Again, she laughed and said", I think you wrote this book, everything in it you have said to me at one time or another." She was right......it is all about our thought process and how we allow our thoughts to control our lives. I have believed for many years, we are our thoughts, we become our thoughts. a road map to feeling better. This has been one of those weeks when my brain has been mush. We were rehearsing today for a gig next week and I butchered every note that came out of my mouth, couldn't remember lyrics, and forget about the guitar playing.........that's when you push on in spite of everything and hope that tomorrow is better. So, I suppose that is my information tonight......sometimes it really is about push coming to shove.......no matter if you don't feel well, or you are not in the mood or whatever......sometimes you just have to push on and hope for the best. Wishing you all Sunday full of rest, joy and time spent with those you love. Tonight, we watched Monty Python and The Holy Grail.......I love British humor and wit. We saw the movie originally in 1975 in Grand Rapids, Michigan. As we walked through the theater doors that night they gave us coconuts, we couldn't figure out why they were handing out coconuts until after the movie started.......everyone in the theater laughed at the same time. The movie was just as funny tonight as way back when. I think if I watched it 25 times, I would still catch a phrase or joke I had not caught before. I read Hitchhiker's Guide to the Universe many years ago, and it became one of my favorite books. Tonight, Rick and I watched the movie and once again I was amazed at how creative,funny and smart Douglas Adams was. I think it's time to read the book again. I would have loved to have met Mr. Adams. Every time I sit in the big green chair, I learn something. One lesson that I learn over and over.......no matter how bad you think things are, there is ALWAYS something worse in someone else's life. Second lesson learned in the big green chair........life is short. Sixth lesson......laughter that takes place when you are in those chairs is the best in the world. Seventh lesson......many think that doctors walk on water, but I am here to tell you, it's the nurses. tomorrow is treatment.....after 32 months of them you'd think I wouldn't dread it so much. Keeping my toes and fingers crossed that dropping the dosage takes care of the serum sickness. Can you tell I'm just a wee bit weary of all this stuff? Fatigue is rough tonight, but my classes today were awesome. A full moon coming, so we did moon salutations in classes today. As I looked out the back door a few minutes ago, the half/ three quarters moon is so bright.......this full moon will be extra special I am sure. Summer moons and winter moons often seem the brightest, autumn moons seem the biggest.....and those in spring seem the most clear. After our fall like weather last week, the heat and humidity are back.......it will be a sweltering moon this week. Whatever moon you see this week, I hope it shines your path with a glow of joy, sets a glimmer of hope in your eyes........and brightens your life for the rest of the month. Go out and catch some moon rays tonight.......it makes you look younger. Taz and I spent a few hours sitting on the screen porch yesterday.......listening to the birds, thunder and finally the rain. She has been great medicine for me. It is amazing how the love of an animal can make the worst of days better. She is a sweetie pie. Hope that this first week of August is good for you........once again I beseech you......enjoy the last few weeks of summer. Taz says, goodnight, sweet dreams. RAIN........we sat on the screened porch this evening and celebrated as rain, lovely rain fell from the sky. We had hit a dry spell, and crops were not happy. My brother, called and said he had watched the weather radar and rain was on the way.......about that time I heard thunder. Rick and I sat on the porch and smiled......I felt the crops, the trees, grass, flowers......everything was smiling with us. Rain and a cup of hot tea made for a perfect end to the day. August 1......according to astrologers Leo is bringing us a new creative, happy time....bring it on.